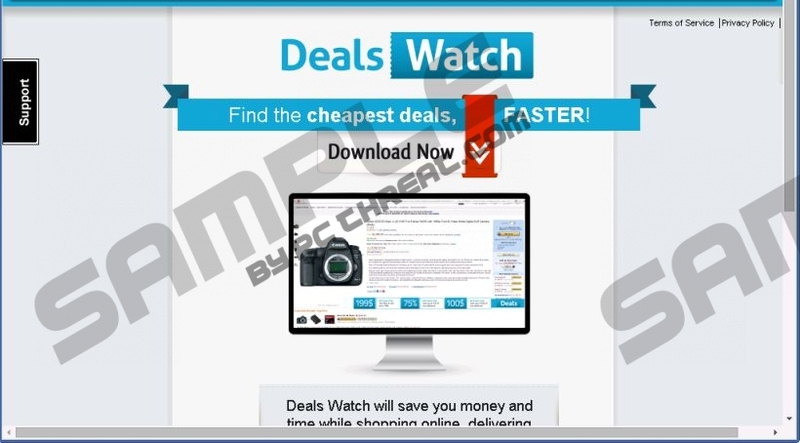 Officially, DealsWatch is introduced as an application that saves your money when shopping online and delivers “the best deal straight to your browser,” however, in practice, it turns out to be annoying adware. The application will spam you with multiple commercial advertisements, cramming outgoing links to third-party websites into your Internet browser, and so it must be removed as it does nothing beneficial. DealsWatch may work as a passageway for potential threats, like Trojans or rogues, to name a few, to your computer; hence, you need to acknowledge the potential danger and do everything you can to avoid it. As far as the distribution of this application is concerned, the direct download option is unavailable because DealsWatch cannot be reached directly via its official site dealswatch.net. It may be shutdown already or not activated yet. The official site shares the same layout with the page for LookaDeal adware application, suggesting DealsWatch also belongs to the Lyrics family. The group of adware programs has first emerged offering users applications that supposedly provided them with a karaoke function on YouTube and other video streaming websites. Unfortunately, that was only a scam devised to trick unsuspecting users into installing these apps. It is best to avoid the adware programs from this family as they never live up to their promises, and they are known for displaying incessantly discounts and coupons, connecting to the Internet without permission, and thus reducing your computer’s resources. The fact that the main website is dead does not mean that DealsWatch cannot get on your system via third-party sites (e.g., file sharing and torrent websites). These websites are usually not monitored for potentially malicious content, so we recommend staying away from unfamiliar sites because they may contain DealsWatch and other adware. Also, be wary when installing such freeware as PDF creators, download managers, video and music players or other applications as they might install additional adware automatically without informing you. Always prefer custom installation over the automatic one as it may allow you to specify installation options, and thus avoid potentially dangerous applications. DealsWatch may not bring any threats to your computer by itself, but it may possess vulnerabilities that could be exploited by the third parties to gain access to your PC. Removing DealsWatch from your system will guarantee that all the data on the PC is remains protected. Another way to make sure the content of your system is safeguarded against potential threats is to download a malware removal program from an approved publisher. Also, always make sure the antivirus program is set to perform a full system scan regularly. Select the undesirable item you want to remove. Select the item you want to get rid of. Hover the mouse to the right side of the screen, and then select Settings in the Charm bar. Select the item you want to uninstall. Quick & tested solution for DealsWatch removal.